One unrehearsed "incident" in Oxford's Invasion exercise yesterday was the demolition of one of the notorious Cutteslowe walls which separate the municipal housing estates from that of the Urban housing estate. 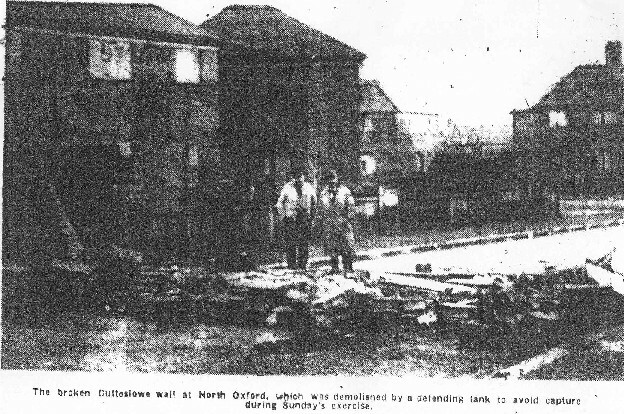 The stretch of wall demolished was that dividing Aldrich road from Sawyer road and it happened when a small number of "enemy" tanks encircled two defending tanks during street fighting in the Cuteslowe Estate. The driver of one of the tanks, realising that there was no other way of escape headed straight for the wall, which was levelled to the ground. The tank crew were strangers to the district and took the wall to be a dummy road block. Many people today visited the spot. Perhaps no other walls in any part of the country have claimed quite so much attention as these, their fame (or notoriety) having spread as far as India. Oxford City Council members have good cause to remember them as a result of the litigation in which the Corporation has been involved over them. On one occasion it was decided to demolish one of the walls by means of a steam roller but the wall was restored.